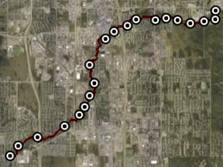 Salmon undergo striking changes when they return from the ocean to spawn in Campbell Creek. 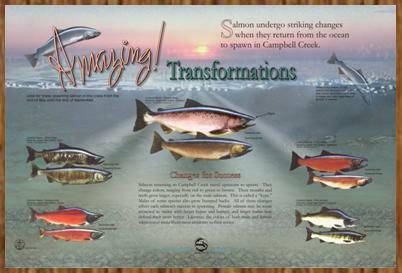 Look for the spawning salmon, illustrated on the panel, in the creek from the end of May until the end of September. When in the ocean, Pacific salmon are chrome bright and look nearly identical to each other in shape and color regardless of gender or species. Salmon returning to Campbell Creek travel upstream to spawn. They change colors, ranging from red to green to brown. Their mouths and teeth grow loarger, especially on the male salmon. This is called a "kype." Males of some species also grow humped backs. All of these changes affect each salmon's success in spawning. Female salmon may be more attracted to males with larger kypes and humps, and larger males may defend their nests better. Likewise, the colors of both male and female salmon may make them more attractive to their mates.